Renault, just like BMW have found out the hard way that focusing too much on KERS during the winter has cost them dearly in aerodynamic performance of the car. The French squad is steadily improving with continuous updates and found out with Alonso that their latest package is an interesting upgrade. The R29 does not have a specific problem but rather suffers a lack of grip, already since the first winter tests. 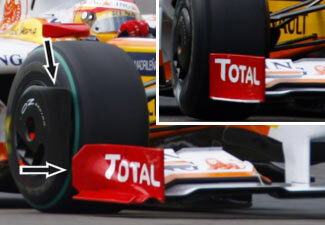 Just like McLaren, the team therefore introduced a new front wing, a much different endplate - which is still quite different from any other car - and a new wheel fairing. The updates were only available for Alonso, but Nelson Piquet will also have them at his disposal during the Hungarian Grand Prix weekend.